I woke up in Old Forge not knowing exactly what to expect for the day. I knew the generalities. The Adirondacks are mountains. There will definitely be some terrain, some climbs, and some fantastic scenery. This would be my first day of riding through a truly mountainous area. The first day of my bike trip had been flat, mostly following the Erie Canal through Western New York. There were rolling hills on the second day, through Central New York, but no significant climbs. A ride through the Adirondack Mountains from Old Forge to Lake Placid would definitely be more of a challenge than the previous two days. I started the day wondering how challenging the ride would be. I knew that the mountains here, or anywhere in the East, are not as tall as the mountains in Colorado. But, I also knew that I had covered quite a bit of distance the past two days, over 100 miles each day, so I could be a bit exhausted. I had read blogs and such about cycling through the Adirondacks, but it’s hard for anyone to deduce how their body will respond to a bike ride based on a blog entry. The same more or less holds true for other activities like hiking and skiing. It barely took a mile or so of riding, northeast on highway 28 out of Old Forge before I began to encounter the splendid lakes surrounded by forests and hills that make the Adirondacks so appealing to so many people. It was about 30 miles into the ride, at a place called Blue Mountain Lake, where the terrain started to become more challenging. The mountains were becoming taller, as I had entered the heart of the Adirondack Mountain Range. Leaving Blue Mountain Lake, heading north on highway 28-N, I encountered the first of a series of challenging climbs. This one was likely the steepest, but throughout the entire ride, each time I passed through a town, I would have a climb after leaving town. I was already a little tired from the first exhausting climb when I stopped in Long Lake, at a farmer’s market I randomly encountered. One of the beautiful things about bike traveling is that, while traveling at slower speeds, it is harder to miss these kinds of random events. Six years ago, while cycling the I & M Canal trail along the Illinois river, I randomly encountered the Grundy County Corn Festival in the town of Morris, IL. At this farmer’s market I talked to the people manning the booth while eating an ice cream sandwich. One thing I notice while bike traveling in general, is that people tend to be interested when they encounter people traveling long distances by bicycle. One of the vendors even told me she had a friend that had graduated from the same high school, on Long Island, as my father (7 years earlier, so no mutual acquaintances or anything like that). The next part of my ride, along state highway 30 from Long Lake to Tupper Lake, was the most challenging for me. Turning towards the Northwest, for the first time on this bike tour, I was facing a significant head wind. And, there were a few segments with significant climbing, including the climb to get out of Long Lake. This was also the part of the ride when negative thoughts started to creep into my head. Anyone that has taken on a large scale physical challenge understands this phase. The body starts to get overwhelmed. It starts to resist. That resistance creeps into the mind through some kind of combination of messages to oneself such as, “you should quit”, “you’re not gonna make it”, “it was a crazy idea anyways”. How to respond to this is always a challenge. From my experience, this occurs anytime anyone truly tries to stretch themselves, and do something that amounts to a serious challenge. There are some that never overcome this phase, repeatedly giving in to that voice telling them to quit. Overcoming this internal pressure, born out of fatigue, builds character. It teaches us all how to endure fatigue and negative pressure in other areas of our lives. I also learned a valuable lesson about understanding what my body needs. I was cycling through this challenging segment at roughly 1:30 P.M., and had yet to eat lunch. The previous day, I had also made a relatively late official lunch stop (around 2 P.M.), but I had eaten a hot dog at 11, something that kept me going. The ice cream sandwich I had at Long Lake was far less substantial. It is likely that by 1:30, my body did not have the nutrition it needed. It’s important to keep in mind that, when traveling by bike your body is your engine, and that engine needs fuel to keep running! After stopping for a full meal, at a place called the Skyline Drive in, which was recommended to me by the woman at the farmer’s market back in Long Lake, I felt refreshed, and realized I had just over 30 miles to go to my final destination for the day, Lake Placid. My mindset did a complete 180! I went from questioning myself at every pedal stroke, to knowing I was going to make it, and finish this beautiful ride. I knew I was getting closer to my destination, Lake Placid, where the Olympic Winter Games were held, twice, when my route diverged from the Adirondack Trail and started following the Olympic Trail. After a brief stop in Saranac Lake, and eight miles along state highway 86, which featured a surprisingly high traffic volume (but also a wide enough shoulder to accommodate bicycles), I arrived in Lake Placid, and gazed upon the mountain that had hosted some of the greatest athletes from around the world on two occations. What a gorgeous town, and what a gorgeous ride, all the way through! It was an exhausting ride, once again clocking in at 100 miles, but this ride through the Adirondacks is a ride I would recommend to anyone. After a nice meal at Lake Placid Pub and Brewery, across from the Hampton Inn where I would spend the night, I spent the rest of the evening soaking in the sunset over Mirror Lake, gazing at the reflection of the mountains in the water below them. I thought about life. I thought about how to live better. How to be better to people around me. How to overcome challenges. I also thought about what I had experienced over the past three days. The New York portion of this ride was nearly complete. Through this ride, from Niagara Falls to Lake Placid, I saw a good portion of the state, much of it which I had never seen before. Having been born on Long Island, and spent much of my childhood going into New York City for various events, museums, shows, etc., I am familiar with the phrase “I love New York”. Having now seen the roaring falls of Niagara, the majestic lakes of the Adirondacks, and many points in between, I can now say “I love New York”, and know I mean ALL of New York. This entry was posted in Cycling, New York, Olympics, Personal Accomplishments and tagged Adirondacks, adventure cycling, cycing, Lake Placid, New York, Upstate New York on July 10, 2016 by Stephen Jaye. I woke up in the morning with a good feeling. It wasn’t a premonition regarding something specific, like when people set out to run a triathlon or take a key exam and get this feeling of confidence that they are going to achieve what they set out to do. After all, this is a bike journey. Accomplishment does not come at the end of this day. It comes at the end of the last day, five days later, when I reach the coast of Maine after six days of riding. The feeling I started the day with was just a general positive vibe, that I knew I was going to have a good day. It is a Tuesday, a day where many people will simply be grinding out their daily lives. For tragically many people, this means stressing out at jobs that do not fulfill them. I get to ride my bicycle, spend the day outside, and see places I have never seen before. I must be thankful for that. On bike journeys there are plenty of things that can go wrong. There’s always the possibility of unpleasant weather, unexpected storms, or an unexpected unfavorable shift in wind direction. There are also the many possible mechanical issues that can occur to a bicycle, particularly one that was recently shipped across the country. The feeling I got was that none of those things would happen, and that I would simply have an enjoyable day on my bicycle. Most Canadians will recognize my way of starting my day off right, with a nice breakfast at Tim Hortons. Food is crucial on a bike trip. It is so crucial that when I took the Adventure Cycling Association’s Leadership Training Course three years ago, it was the very first thing they talked about, before bike mechanics, camping/lodging, or even the basics of bike touring. How to pack trailers, roof racks, panniers, etc. would not be covered until the next day! I know one bad meal can really strain a bike trip, particularly if it’s breakfast, so I made it a good one before crossing the border back into the United States. Before leaving the Niagara area, I took one last view of the falls from a place called Goat Island. Goat Island is between the two falls, and on the American side. It offers a pretty good alternate view of Horseshoe Falls, which is directly across from a place called Terrapin Point. It might be the best view on the American side of the falls, but, as I mentioned in my prior post, the Canadian side still offers better views overall. I would spend most of my day cycling on one of the Nation’s longest bike paths, the Erie Canal trail. I knew that this was going to be a flat ride. The Erie Canal is a waterway that was built in 1824 to provide a shipping route between the Great Lakes and the Atlantic Ocean. 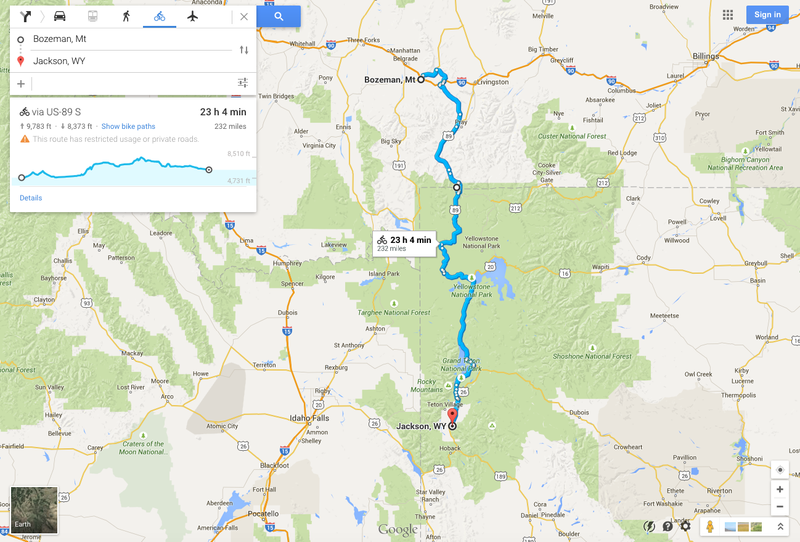 In order for the very concept to work, they had to find a route with very minimal elevation change. When the canal was built, a series of locks were built to regulate the water flow. The first town we encountered after picking up the trail was Lockport, New York, a small town with one of these locks at the center of town. East of Lockport, the trail surface becomes crushed limestone. Staying right next to the Erie Canal, the scenery I encountered was quite constant. Much of my day looked exactly like this. This trail is flat, and largely straight, which is good for covering a large number of miles in one day. I spent most of my time on this trail just thinking about the Erie Canal itself, the amount of work it must have taken to build it, and its role in transporting goods across the Union in the Civil War, which some consider to be a major factor in the eventual Union victory. On a day like today, covering a lot of miles on a trail with consistent scenery, it is easy to lose track of each individual town. This is why one of my favorite features of the Erie Canal Trail, at least in Western New York, is these bridges. Each of them have the name of the town labelled on top of the bridge, so as cyclists approach, they know which town they are, in fact, approaching. I generally liked Western New York for bicycling, and bicycle accommodations. Obviously, there is the trail, but also many of the roads include wide enough shoulders to accommodate bicycling. Additionally, New York is one of the states that has labelled state-wide bike routes, which add some level of legitimacy to cycling as a form of transportation. The exception, at least for me and the route we followed, was Rochester. We split off the Erie Canal trail in order to ride, and eventually camp, along Lake Ontario. This involved getting off the trail and following State Highway 104 into town. Like other Western New York roads, this road had a shoulder. However, this shoulder had frequent obstacles, mainly sewers, that we needed to cut into traffic to avoid. After that, we cut over to the lake in a suburb called Sea Breeze only to find out that the bridge we were hoping to take, over Irondequoit Bay, was closed for the summer. We were told that the bridge would re-open in November. I am accustomed to roads being closed in wintertime, but not in summertime. I never would have thought to even check to see if any bridge that I was hoping to take would be closed. What was so frustrating about this was that the bridge itself, seen in the distance, and also on this map, is so short. It couldn’t cover more than fifty feet, and, as a result of that bridge being closed, we had to back track all the way around Irondequoit Bay, adding a significant number of miles to the trip. I ended up having to invoke my backup plan. I had already ridden more miles in one day, 112, than I had ever before in my life, smashing my previous record of 104. Without the detour, I would already be close to my destination for the day. But, I knew I needed to save some energy for five more days of riding. So, I got a ride for the remainder of the day’s trip, which ended at Sodus Point, at a campground where I could watch a beautiful sunset along Lake Ontario. The obstacle I faced was not one of the ones I had anticipated. Usually when I think of what can go wrong on a bike trip, wind, rain, and flat tires are the first things that come to mind. A bridge closed for the summer is the last thing that would occur to me. In fact, it took nearly three days for me to eventually realize the likely reason for a summer bridge closure; so boats can pass through from the bay into the lake. Still, I consider this sunset along one of America’s Great Lakes a great end to a great day on my bicycle. This entry was posted in Camping, Canada, Cycling, history, Personal Accomplishments, Recreation Trails, seasons and tagged adventure cycling, Cycling, Cycling, Erie Canal, Erie Canal Trail, New York, Niagara Falls, Sodus Point, Western New York on July 6, 2016 by Stephen Jaye. I must be insane! The same thoughts have kept popping up into my head about my upcoming trip ever since I planned it roughly six weeks ago. I am so conflicted. On one hand, what I am doing is significantly outside the realm of what “normal people do”. On the other hand, compared to most long-distance cyclists, my plan is actually rather tame. My upcoming trip involves cycling (or attempting to, we’ll see how it goes) 600 miles over the course of six days, starting at Niagara Falls, New York, and ending on the East Coast at Portland, Maine. I am actually joining my friend Clay for half of his 1250 mile journey, which he started in Chicago. So, while I am taking this cycling thing to a whole new level, I can’t help but think about the fact that there are plenty who do trips that are way more elaborate than mine. This map represents an approximation of the route that I will be taking. There are a few things that are still up in the air, and we may improvise a bit. But we are certainly planning to head northeast through the Adirondack Mountains as opposed to taking the most direct route through Saratoga Springs. It will add a few miles to the trip, but we will get to see places like Old Forge, Saranac Lake, and Lake Placid. Last year, I joined my friend for one of his journeys, but chose a much shorter segment, from Bozeman, MT to Jackson, WY. This 230 mile bike ride took me through Yellowstone and Grand Teton National Park, and at this point is still the longest and most exhausting bike ride I have ever done. This year, I took on a much longer ride for reasons that are somewhat personal. I grew up on Long Island, just outside of New York City. However, I moved away when I was only eleven years old. Still, at face value, it always seems odd to people when they hear that I am from New York and have never been to Niagra Falls, as well as countless other places in the region. In fact, there are nine states I have never been to, and Vermont is one of them. In about a week’s time, my number of remaining states to visit will be down to eight! I can’t fault myself for having not been to these places. After all, it takes many people until nearly the age of eleven to start developing an individual identity, and for many it takes even longer to develop an appreciation for travel to places of natural beauty. I remember taking the ferry from Orient Point on Long Island to New London, Connecticut several times as a child. While I remember the smell of the salt water, I do not remember appreciating the scenic coastal town in front of me. After months of what still doesn’t feel like enough training, I am ready to take on the longest bike ride of my life, and see many of the places I “should have” seen as a “New Yorker”. I feel anxious. Will I make it? Did I train enough? Will it rain? Will it get windy? Will some other hazard emerge? Or, will the lower elevation and relatively easier terrain (for the first half of the ride along the Erie Canal) make it feel easier than my normal cycling around Colorado’s Front Range? Whenever I plan to do something major like this, there is also always this tug of war that goes on inside my head. Maybe this is normal. I don’t know. On the surface, I understand what it means to go outside of one’s comfort zone, and do something unique. There is a greater risk and a greater reward than sticking to activities that are easy and familiar. Sometimes, particularly when doing something major, a part of me gets this nagging feeling of guilt inside my head, like I am skipping out on some kind of responsibility. It’s strange, and I don’t know why it occurs. In a way, it bums me out that this feeling occurs at all. I know that life was meant to be lived, and the world was meant to be explored. Yet, in the back of my mind this feeling just occurs, making me feel like I should be doing something boring, like work, or house cleaning. I wonder if others get that feeling too. I wonder if we’ve been conditioned in some way to feel guilty about taking extended periods of time to do something for ourselves. I’m glad I’ve learned to work through this feeling, preventing it from costing me countless opportunities over the years. Still it would be nice to silence it altogether. Sometimes we need to push ourselves, or be pushed, to truly figure out who we are. Perhaps this requires the right level of insanity. Last weekend, I attended two weddings, one in Breckenridge, CO, and one in Chicago, IL. They were on back-to-back days. This is, in some ways insane. Yet, I did not do anything out of control, that could land me in jail or on a hospital bed. Perhaps I have already found this proper level of insane! This entry was posted in Cycling, psychology, trip preview and tagged adventure cycling, Cycling, self, trip anticipation, trip preview on June 24, 2016 by Stephen Jaye.